Some days I am more haunted than others. Some days my face paints all the mirrors so black the glass screams in fear of its blindness. Some days my face gets into car windshields and turns them a so viciously dark they want to shatter outward into skin. 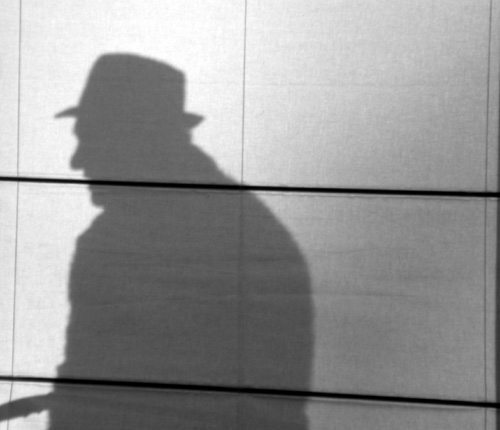 Some days my shadow plans all the ways it can to escape from the wall. It wants to become the ultimate outlaw, maybe already is. I’d spent the morning writing a section of DILLINGER and I was exhilarated to the point of not being able to sit still. 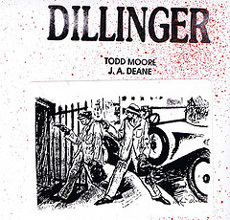 Reading did no good because everything I read had a piece of that DILLINGER section in it. And, when that happens, just the thought of DILLINGER infects everything, even the air that I breathe. When I get like that I have to drive it out of me, gun that car engine so hard the needle wants to fly off the speedometer. That’s when I have to go out somewhere, really escape the air that I’m standing in. So, I drove up into the mountains because they were mountains and because there were storms up there and I suddenly had an overwhelming desire to be driving into them and maybe even literally be covered and surrounded with clouds so gray and dark they felt like long tunnels of tomb after tomb with a continent full of wind blowing through. Kell Robertson’s standing on the sidewalk in front of Silva’s Saloon. He is dwarfed by the Sandias and he knows I’m watching him in the rear view mirror as I drive away, so he gives me his big outlaw grin and points his gunfinger at me. Then he fires an air bullet and lets his hand drift up in faux recoil. That’s his way of giving me his own special version of the Death Wave. And, he’s laughing hard in a black wind blowing in off the mountains. Right after I wrote Death Song I raced up into the mountains because that poem took place there and had an old Navajo in it and he was dying along some stretch of old 66 and I had to drive the full length of Tramway which skirts the Sandias because somehow I was looking for that old man. I had to find him and give him a five dollar bill and a pack of cigarets, the same way that Dillinger did in the poem. I was convinced he was waiting up there along the side of the road and when I realized that he wasn’t there except in the best of all of my big dreams, I drove down Central and gave the cigarets to a homeless man standing on the corner of Central and Carlisle. But, some nights when the wind howls through Tijeras Pass I dream of that old man dying in the snow and the wind by the side of the road. I dream of him and dream of him and then I am dying, too. Tony Moffeit’s on the phone. He’s trying to tell me about the essence of Billy the Kid, the whole blood story of Outlaw, but his voice is breaking up in the black ache of cosmic static, black hole drift, and death noise. However, a few of his words crack through the void. Voodoo, guns, Kid, bones, chile, blues, and beer. His voice was dying into his words and then back into the horrible burn and scorch of itself. Tony is searching for the dream Kid, the shamanic Kid, the blues Kid, the Kid who knows the secret code for the deep night of america. It’s easy to die in a poem. It’s so easy to die into the writing of a poem. And, the poem loves you for it. The poem is so hungry for the taste of the human that it doesn’t know what to do with itself. I think Whitman must have died a little in Song of Myself. In fact, I’m sure of it. It’s just the way that he talked in that poem. The way that he opened up his entire self and talked to everything. You can’t open yourself up that way without dying, even for just a little bit. I think when Faulkner wrote The Bear he must have died a little. 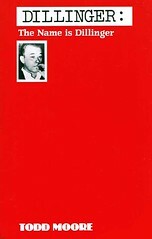 You can’t write about men and animals that way without having a piece of your personal dream self dying, even if it is a small piece, a piece no bigger than your thumb, your index finger. You can’t write about men and animals and wilderness and dreams and wounds and death and madness that way without dying a little and I know that Faulkner died a little bit after the whiskey and the storytelling and the blood talk and the dreams in that old hunting lodge. He had to. I know for a fact that when Maria Sabina sang her veladas to cure people she died in the fury of that singing, even though it was a little death. Maybe a little piece of her voice cracked off in the blood and vomit and went up through the trees and even farther up into the air and then the clouds. Or, maybe a very small piece of her skin sloughed off and went down into the ground where the bush and tree roots got hold of it and were nourished by it. But, whatever happened, Maria Sabina died through her songs and then her songs brought her back for another long singing and shivering cure, it works like that. You can’t cure anyone without singing yourself into all the fever dreams of the nightworld. The cramped dying of the singer plunging into the toxins and electricity of the song and then the power of that song bringing the singer back. That is the magic of the song, that is the primal power of poetry. I can’t imagine Picasso painting Guernica without dying in his dreams after a long day of painting. I can’t imagine Picasso painting Guernica without losing something of himself in those nightmares of being burned alive and blown to pieces. His fingers coming off and running away because the death strokes he used on that painting were so terrible the fingers just had to run away from Picasso’s body and hide in all the little out of the way places of Paris. Some nights his fingers would run away. Some nights his toes. Even his eyes wanted to escape from his body and he would put up big fights in his dreams to keep them from going but he knew he was always going to lose. And, then they were gone and he had to use his dream eyes to see. And, his dream eyes would permit him to see unpainted parts of the painting that his real eyes could not bear to look at in the dark. Then, the next day he would get his fingers or his toes or his real eyes back for another hard bout of painting. They would come back because something way out there in the night would heal them would take the death blisters off and then he could use them again. But Picasso always died while he was painting Guernica. He had to if he wanted even an ounce of that paint to become human and even to dream. There are those times I get so haunted that it feels like the chills and fevers are about to split open the skin on my arms. There are those times I get so haunted that I can’t do anything except move and keep moving and have my headlights shoving as far up into the black peaks as they can. The first rule in america is that you have to move or die. That’s why people drive so fast. That’s why the clouds in the southwest move faster than anywhere else. That’s why everything blows up here better than anywhere else. That’s why explosions in american movies are better than anywhere else. That’s why games like Quantum Pinball work here with such murderous ferocity. If you are looking for death while summoning the duende, all you have to do is whisper d=av squared. Death will be all over you in a nano second. Death will make love to all of your scars. Death will eat both you and your pain and then ask for more. John Macker is standing out behind his house and is surrounded by dry sticks and mesquite and sage and cactus and scrub brush. The Sangre de Cristos tower in the distance. They are crowned with black clouds, lightning, shadows, and snow. Macker is wearing his ghost dance shirt. It’s the one where in his dreams all the stars, the circles, and the moon crescents move. He stands next to a stone slab holding an old rusted shut typewriter. He knows it won’t work but he believes if he touches it just right it will give him the first line to a new section of Underground Sky. And, he knows that this is the poem that will define him, this is the poem that will heal him. 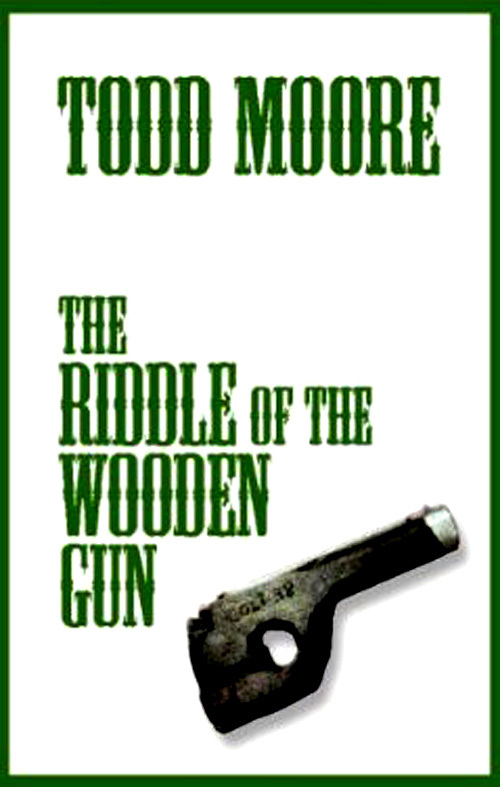 I am reading The Riddle of the Wooden Gun to the wall. And, because the house I am living in is an old one and there may be many spirits also staying here, I am reading to all those unseen presences. I am testing my voice out on the poem but I am also conducting a healing reading. I am reading to try to heal all the wounds in this house and in the ground under the house where the ancient ones may have walked. While I was writing the conclusion to Dillinger’s Thompson I began to get this overpowering urge to run out and find a Thompson sub machine gun somewhere because I wanted to touch it, I wanted to annoint myself with it, I wanted to feel all of its sharp angles and curves, I wanted touch the barrel where the bullets came out. And, I somehow realized that this was the only way I could find some kind of closure to the poem. So, I visited every gun shop in town. With no luck, though I did get to touch all kinds of large caliber pistols, some shotguns, and a few assault rifles. But it wasn’t the same thing. I had to have a Thompson right then, at that precise moment and there were none to be found. Years later at a gun show I did get to touch a Thompson but by then it was already too late. The moment had passed and somehow, this is something I can’t explain, Dillinger’s Thompson will always feel jagged, fragmented, spiritually unfinished even though I know, as a poem, it is finished. Just the way that america is unfinished, will always be slightly jagged and unfinished because the dreamt of parts can somehow never be touched, can somehow always be lyrically violent in their unfinished state. And, maybe that’s the way I want the poem. And, maybe that’s the way I want america. When I was a kid I used to have a friend by the name of Donny whose father used to carve him toy wooden guns. He’d sit out behind that falling down wreck of a hotel on the runningboard of an old 1933 Pontiac holding a broken off tree branch in one hand and a Case Double X jack knife in the other. He’d have a lit roll your own jammed into his mouth, his eyes would be nothing but slits in the top half of his head on collision face and he’d be talking about a stock car he was planning to build and he’d be curling the wood back on that stick which was maybe not much bigger than a man’s wrist and pretty soon he had part of that wood looking like a gun barrel and then he’d glance up though I don’t think it was at any one thing in particular but he’d look up like he was taking a break from talking or carving and he’d look way off at the sky and then he’d start in carving again. He always left a little bark on the wood. When I asked him why he said, it’s to let the wood remember where it came from. If the wood can’t remember what it used to be, then it won’t be wood anymore. It wouldn’t be anything. In my opinion, those toy wooden guns were really works of art. They even had names carved right on the grips like Desperado and Outlaw and Bandito. I remember that Donny gave me one for hitting Kenny T in the face. But I have no idea what became of it. It got lost, or stolen, or burnt up, or run over, and smashed up in the garbage like most things in america. America has a genius for the art of destruction, unparalleled in the history of mankind. The true definition of america is both the birth and the death of poetry. The dark definition of america is and always will be outlaw but you can’t think about it that way for very long because death gets into it and has a way of infecting everything, even lilacs, even rain. Thinking about dying was the way I got around to writing The Corpse Is Dreaming. I’d written a lot of poems about people getting shot and killed but not so much about the act of dying itself. It’s so much easier just to show death than to get inside of the dying itself. And, I didn’t want to think about Dillinger dying because he seemed so alive, so full of the kind of energy that only a few people can ever dream of. He was my buffer, my bodyguard, my free zone, my letter of transit, my get out of jail ticket to any serious thought about what it must feel like to die. And, then one night when all of the demons came knocking at my door at once, I actually thought about Dillinger dying. I saw the bullets go into him and I didn’t like it because whatever bullets went into him also went into me and I hated that more than anything I could ever explain. I ached inside that crackup, I broke apart inside the full impact of that death. And, then I could write about it. Just like that. Even though it felt like I still had the bullets inside of me, I could write about it. Or, maybe somehow I had to have the feeling of those bullets floating around in my head and through my back and side before I could get the first few lines of The Corpse Is Dreaming down on the paper. I had to dance through the reenactment of his death before I could even try to write about it. And, once I got started I had to get it all down, all of it, everything before it ever felt done. Except that this is a section that also feels slightly unfinished. And, it isn’t so much connected to the words as it is connected to the psychic/visceral feel of it. That skin/dream fracture of everything in a human body breaking off from every other thing. The experience of the human question morphing into the great inhuman silence. That was the feeling, that was the event of death I was reaching for because in this poem the corpse was both the dream and the dying. The corpse was my shadow coming back to the wall. Several years ago while I was walking down Central back to my car a man stopped me. At first I thought he was going to ask me for some spare change and I was about to wave him off when he said, this is not about money. That’s when he held out his hand. He was holding three smashed up lead slugs. He gave me a twisted smile and said, I’ve been looking for someone to give these to. They were in me and then they were out and if I don’t give them to someone who knows what death is I will keep right on dying. When he dropped them into my hand he said, they will keep you safe. Death doesn’t like his toys anymore once they have failed in their tasks. When I’d finished writing The Corpse Is Dreaming, I got into the car and drove up to the mountains. I had to plunge through shadows and mists and clouds and be in the presence of all those monstrous boulders. And, the wind. I had to be somewhere up in the wind. But this time there was more to it than that. It wasn’t just because I was so excited and haunted and shaking with energy that I couldn’t do anything else. It was because I somehow had to wash myself clean of death in the high mountain air. I had to let the wind heal me. 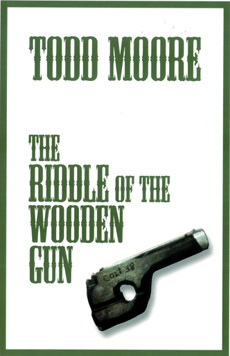 todd moore does it again. that is, turns the essay inside out, so that it is not only essay, it is poetry, it is dream language, and it is the essence of outlaw. the subject is death. never has death been dissected like this. so that in the creative act, a part of one dies to give life.